The Friends for Conservation and Development is reporting tonight that they caught 2 Guatemalan residents poaching rare birds from inside the Chiquibul National Park. One of them took aim at a ranger with a .22 rifle, and the rangers then had to shoot at one poacher who escaped. The poacher threw down his rifle as he ran. Fortunately no one was hurt - but the armed encounter shows the escalating level of danger in that forest. It happened yesterday morning at around 10:30, about 4 kilometers from the Western Border. The FCD rangers were training some recruits when they encountered 5 Hispanic men. Three of them escaped, so 2 out of the 5 were detained, and the .22 rifle, which had an empty magazine, was retrieved. The rangers searched the area and found 2 crocus bags. One bag contained 1 male curassow, 2 female curassows and one crested guan - all dead. 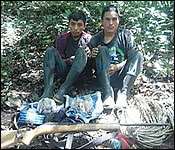 The second bag contained clothing, food, ropes, and a pair of climbing spurs which are used to take down macaw nests. 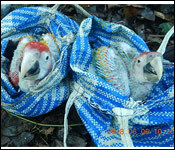 Two separate small bags were also found and each contained a scarlet macaw chick. The 2 men were later identified as 29 year-old Edras Geovani; a Honduran native who has been living in the Guatemala Village of La Rejoya, Peten; and 18 year-old Elder Mauricio Diaz, a resident of Morales, Izabal, Guatemala. Both were detained by the FCD personnel who are special constables, and they were were escorted to the San Ignacio Police Station, where they were handed over to the Police at 3:55 this evening. They face multiple criminal charges. Buyers from the Peten Department arrive either on car or motorcycle to purchase the birds at border villages such as La Rejoya. Just last week, the FCD intercepted another 5 poachers but all managed to escape. These macaws were estimated to be some 50 days old, and it is estimated that they were caught 4 days ago. 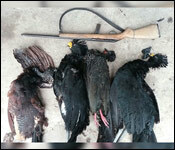 These birds were handed over to the Forest Department where it is expected that a veterinary diagnostic will be made and recommendations determined for safeguarding these birds. Poached macaw update - inserted into foster nest: We are elated to share that thanks to excellent work and close cooperation between FCD, FD and BWRC these two chicks got very "lucky" in the their misfortune: first they had the "luck" to be confiscated right in time (congratulations again to the amazing FCD rangers!!!). As is recommended for all poached animals, they were given specialised veterinary care and a health check by BWRC as a first step. Thankfully the chicks responded well to rehydration and introduction of proper diet, the health check revealed no major concerns and within 24 h the green light to return to the Chiquibul was given by our vets, the Forest Department and last but not least FCD's research team. The biggest "luck" for these chicks (and us) was that thanks to FCD's nest monitoring we knew that we had a possible foster nest in the monitored area in the Chiquibul. So with everybody's consent, that is what we did. And the best news: the new (foster) parents fed the introduced chicks immediately. 24 h after introduction we left and FCD research team continues to monitor. Fingers crossed we managed to undo a wrong and let nature take back over. Luckily these chicks were saved from the illegal trade to fly free over the Chiquibul - and do not have to be raised by humans (which we can do if necessary, but same species parents are always the best!). A lot of lucky coincidences made this rescue and foster introduction possible and close cooperation by all partners was essential to the success. Thanks to all involved! Sad undertones - poaching is still very much an issue and more help is needed to protect nests. It takes a (large and multidisciplinary) team to protect the gem. If you have what it takes to camp in the most basic conditions in the Chiquibul and are interested in volunteering for 1 week of nest monitoring please contact BWRC ([email protected]) or FCD.